As best we can determine, Jones lived with the Powderlys, off and on, for several years near the end of her life (she often called the Powderly house "home") and these papers appear to have been included with the much larger Terrence Vincent Powderly donation when it was made to Catholic University in 1939. Powderly was from the mining areas of northeastern Pennsylvania and was head of the Knights of Labor, the largest labor union in the nation in the nineteenth century. Jones appears to have met Powderly through this work and become fast friends. ? 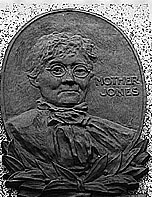 John Mitchell was head of the United Mine Workers from 1899 to 1908 and hired Mother Jones as a union organizer. His correspondence includes thirty letters from or to Jones discussing the union's efforts to organize miners and carry on strikes from Pennsylvania to Colorado. The Mitchell papers contain over two hundred photographs? The Mitchell Papers were donated to Catholic University by his children in 1943 and, with the exception of some AFL-Minutes, no restrictions were imposed upon them. They have been among the most heavily used collections in the Catholic University Archives.